Saintpaulia is a commonly used as a decorative houseplant. A houseplant is a plant that is grown indoors in places such as residences and offices. Houseplants are commonly grown for decorative purposes, but studies have also shown them to have positive psychological effects. 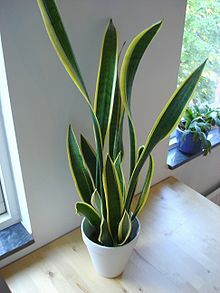 Houseplants also help with indoor air purification. Some species, and the soil-dwelling microbes associated with them, reduce indoor air pollution by absorbing volatile organic compounds including benzene, formaldehyde, and trichloroethylene. While generally toxic to humans, such pollutants are absorbed by the plant and its soil-dwelling microbes without harm. Common houseplants are usually tropical or semi-tropical epiphytes, succulents or cacti. Major factors that should be considered when caring for houseplants are moisture, light, soil mixture, temperature, humidity, fertilizers, potting, and pest control. The following includes some general guidelines for houseplant care. Specific care information may be found widely online and in books. Both under-watering and over-watering can be detrimental to a houseplant. Different species of houseplants require different soil moisture levels. Brown crispy tips on a plant's leaves are sign that the plant is under watered. Yellowing leaves can show that the plant is over watered. House plants need drainage in the pots, because if the water builds up at the bottom of the pot, root rot can occur. A skylight provides sun to these plants. Different plants require different amounts of light, for different durations. Photoperiodism is a consideration, since some plants such as Poinsettia and Schlumbergera are influenced by either decreasing or increasing daylight hours. Some potted plants can grow very large. It is possible to supplement window light with artificial lighting of suitable wavelengths. Houseplants are generally grown in specialized soils called potting compost or potting soil, not in local natural soil. A good potting compost mixture includes soil conditioners to provide the plant with nutrients, support, adequate drainage, and proper aeration. Most potting composts contain a combination of peat and vermiculite or perlite. Concern over environmental damage to peat bogs, however, is leading to the replacement of peat by coir (coconut fibre), which is a sustainable resource. Sterilised soil can also be used. Most houseplants are tropical evergreen species that adapted to survive in a tropical climate which ranges from 15 °C to 25 °C (60 °F to 80 °F) year-round. This is similar to the temperature in most homes. Humidity is slightly more difficult to control than temperature. However most species of houseplant will tolerate low humidity environments if it’s watered regularly. Homes are often around 20% to 60% relative humidity. Such a range is acceptable, although most species thrive near 80% relative humidity. To increase humidity one may mist plants with distilled water or use a humidifier. Plants require soil minerals, mainly nitrate, phosphate, and potassium. Nitrogen is essential for green, leafy growth. Phosphorus is essential for flowering or fruiting plants. Potassium is essential for strong roots and increased nutrient uptake. Minor and trace elements, such as calcium, magnesium and iron, may also be necessary. Proper pot size is an important factor to consider. A pot that is too large will cause root disease because of the excess moisture retained in the soil, while a pot that is too small will restrict a plant's growth. Generally, a plant can stay in the same pot for two or so years. Pots come in a variety of types as well, but usually can be broken down into two groups: porous and non-porous. Porous pots are usually clay and are highly recommended because they provide better aeration as air passes laterally through the sides of the pot. Non-porous pots such as glazed or plastic pots tend to hold moisture longer and restrict airflow. Another needed feature is drainage holes. Usually pots come with holes in the bottom to allow excess water to flow out of the soil which helps to prevent root rot. If a pot does not have drainage holes, it is best to double pot that plant so the inner pot can be lifted out and the excess water accumulated in the bottom of the outer pot can be removed. Soak old pots thoroughly in a solution of 1 part bleach to 10 parts water to kill any bacteria that may remain. Indoor plants reduce components of indoor air pollution, particularly volatile organic compounds (VOC) such as benzene, toluene, and xylene. The compounds are removed primarily by soil microorganisms. Plants can also remove Carbon dioxide, which is correlated with lower work performance, from indoor areas. The effect has been investigated by NASA for use in spacecraft. Plants also appear to reduce airborne microbes and increase humidity. VOCs are more common in indoor areas than outdoors. This is because air and VOCs get trapped in indoor spaces; there is less air circulation. There are over 350 known VOCs. They are causative agents for “building-related illness” or “sick-building syndrome”. Symptoms of this illness include: irritated eyes, nose or throat, headache, drowsiness and breathing problems. These symptoms may not always be present, however, and chronic exposure may lead to lack of concentration and other health issues such as asthma and heart disease. Urban dwellers spend up to 90% of their time indoors so they are at higher risk of experiencing the adverse effects of indoor air pollution. Common plants used to remediate indoor air pollutants include: English ivy (Hedera helix), Peace lily (Spathiphyllum ‘Mauna Loa’), Chinese evergreen (Aglaonema modestum), Bamboo palm (Chamaedorea seifrizii), and Chrysanthemum (Chrysanthemum morifolium). There are several studies that cite the plant microcosm as a mechanism to reduce indoor VOCs. Controls of just pots alone and just a tray of water suggest that it is the soil microcosm that provides the pollutant sink. The role of the plants is to establish and maintain the species specific root-zone microbial communities. This mechanism was first suggested by Wolverton et al. in 1985. Houseplants also aid in humidity, temperature, and noise control. NASA conducted a two-year study in 1989 to test the ability of houseplants or potting soil to remove several VOCs from the air. The experiment included the chemicals: benzene, TCE, and formaldehyde. The study was conducted in airtight experimental chambers. They found that bacterial counts correlated with increased chemical removal. Another interesting result they found was that when the same plants and soil were constantly exposed to a chemical such as benzene, their capacity to clean the air increased over time. This is because microorganisms have the ability to genetically adapt. Therefore, they change over time in order to utilize the toxic chemicals more efficiently as a food source. This phenomenon is used as a strategy to treat wastewater. Aside from traditional soil mixtures, media such as expanded clay may be employed in hydroponics, in which the plant is grown in a water and nutrient solution. This technique has a number of benefits, including an odorless, reusable, and more hygienic media. Any habitat for soil-bound pests is also eliminated, and the plant's water supply is less variable. However, some plants do not grow well with this technique, and media is often difficult to find in some parts of the world, such as North America, where hydroponics and specifically hydroculture is not as well-known or widespread. Subirrigation offers another alternative to top-watering techniques. In this approach the plant is watered from the bottom of the pot. Water is transferred up into the potting media (be it soil or others) by capillary action. Advantages of this technique include controlled amounts of water, resulting in lower chances of overwatering if done correctly, no need to drain plants after watering unlike traditional top-water methods, and less compaction of the media due to the pressure put on the media from top-watering. A 2015 study showed that active interaction with houseplants "can reduce physiological and psychological stress compared with mental work." A critical review of the experimental literature concluded "The reviewed studies suggest that indoor plants can provide psychological benefits such as stress-reduction and increased pain tolerance. However, they also showed substantial heterogeneity in methods and results. We therefore have strong reservations about general claims that indoor plants cause beneficial psychological changes. It appears that benefits are contingent on features of the context in which the indoor plants are encountered and on characteristics of the people encountering them." The phenomenon of biophilia explains why houseplants have positive psychological effects. Biophilia describes humans’ subconscious need for a connection with nature. This is why humans are fascinated by natural spectacles such as waves or a fire. It also explains why gardening and spending time outdoors can have healing effects. Having plants in indoor living areas can have positive effects on physiological, psychological and cognitive health. There is an architectural design approach known as “complexity and order” that coincides with biophilic design. Complexity and order is defined as, “the presence of rich sensory information that is configured with a coherent spatial hierarchy, similar to the occurrence of design in nature.” Humans enjoy looking at things that are not boring but also not too complex. This design strategy is based on nature and human’s response to designs in nature. The presence of plants and nature-inspired designs is restorative and not dull like the modern cookie cutter designs. ^ Chicago Botanical Garden, Indoor Gardening, Pantheon Books, New York, 1995, p. 182. ^ a b c Wood, Ronald A.; Burchett, Margaret D.; Alquezar, Ralph; Orwell, Ralph L.; Tarran, Jane; Torpy, Fraser (2006). "The Potted-Plant Microcosm Substantially Reduces Indoor Air VOC Pollution: I. Office Field-Study". Water, Air, and Soil Pollution. 175 (1–4): 163–180. Bibcode:2006WASP..175..163W. CiteSeerX 10.1.1.466.4897. doi:10.1007/s11270-006-9124-z. ^ Lee, Min-sun; Lee, Juyoung; Park, Bum-Jin; Miyazaki, Yoshifumi (2015-04-28). "Interaction with indoor plants may reduce psychological and physiological stress by suppressing autonomic nervous system activity in young adults: a randomized crossover study". Journal of Physiological Anthropology. 34 (1): 21. doi:10.1186/s40101-015-0060-8. PMC 4419447. PMID 25928639. ^ Bringslimark, Tina; Hartig, Terry; Patil, Grete G. (2009-12-01). "The psychological benefits of indoor plants: A critical review of the experimental literature". Journal of Environmental Psychology. 29 (4): 422–433. doi:10.1016/j.jenvp.2009.05.001. ISSN 0272-4944. ^ a b c d e f g h Ryan, Catherine O.; Browning, William D.; Clancy, Joseph O.; Andrews, Scott L.; Kallianpurkar, Namita B. (2014). "BIOPHILIC DESIGN PATTERNS: Emerging Nature-Based Parameters for Health and Well-Being in the Built Environment". International Journal of Architectural Research: Archnet-Ijar. 8 (2): 62. doi:10.26687/archnet-ijar.v8i2.436. This page was last edited on 19 March 2019, at 22:57 (UTC).